If you have develop your own shopping cart and need manual integration by yourself, here are the details. To start we will need the information as below. These can be retrieve in senangPay Dashboard. 2. 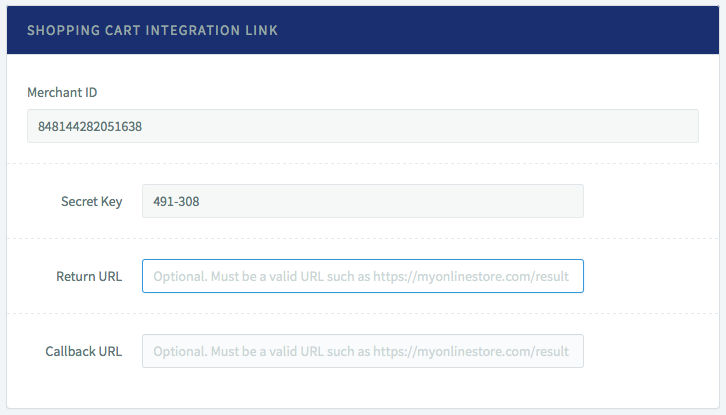 Refer to Shopping Cart Integration Link section. Get your Merchant ID and Secret Key information. 3. Then you will need to fill in the return URL. This is the URL where senangPay will redirect the buyer after the payment has been processed. 4. Next, you need to fill the Callback URL. Callback URL is used as alternative notification to merchant shopping cart in case there is a breakdown in transaction flow. For more info on Callback URL, read here. This is the description to be displayed when making the payment. The maximum length is 500 characters. Any underscore (_) characters will be converted to space. Example Shopping_cart_id_30. Only A to Z, a to z, 1 to 0, dot, comma, dash and underscore allowed. The amount to charge the buyer. The format must be in 2 decimal places. Example 25.50. This is the id to be use to identify the shopping cart when senangPay redirect back the buyer after the payment was made. The maximum length is 100 characters. Example 3432D4. Only A to Z, a to z, 1 to 0 and dash allowed. The is the data to ensure the data integrity passed from merchant’s shopping cart to senangPay. Refer to How to generate the secure hash section for more info. This is the name to populate in the payment form so that customer do not have to key in their name. This is optional and not have to be part of the hash. Customer is able to overwrite the value in payment form. This is the email to populate in the payment form so that customer do not have to key in their email. This is optional and not have to be part of the hash. Customer is able to overwrite the value in payment form. This is the phone to populate in the payment form so that customer do not have to key in their phone. This is optional and not have to be part of the hash. Customer is able to overwrite the value in payment form. 1. The parameters can be send either using GET or POST method. 2. The URL is https://app.senangpay.my/payment/ followed by your merchant ID. This is to indicate the status of the payment. It only has 2 values which is 1 for successful and 0 for failed. This is the order that was sent to senangPay. This is to identify the shopping cart transaction. This is the message to describe the payment status. The maximum length is 100 characters. Take note that the message may contain underscore. You can replace the underscore as space when displaying the message to your customer. Example Payment_was_successful. This is the data to ensure the data integrity passed from senangPay to the merchant’s shopping cart. Refer to section How to verify if the secure hash is correct for more info. 1. The parameters will be send using GET method. 2. The parameters are sent to URL as configured in the return URL. Refer to Info required section. 1. Merchant will need to generate the secure hash and compare the secure hash that was received from senangPay. 3. So the string to be hash is 53-78415614363538840Payment_was_successful which will generate hash value as 69686562c29ad3f7955b1843a5c275ca. 4. Now you need to compare the hash value that you have generated with the hash value sent from senangPay. If the value does not match then the data may have been tampered. For your refference, please refer to this sample code. Kindly please download from here.